Welcome to the new look Newsletter from Jugglingworld! In this edition, I look forward to telling you about my newly launched website, as well as providing part 2 of the “How to Run a Circus Skills Workshop” article. Enjoy! Search Box so that you can find exactly what you want quickly! (near the top of the right hand column on every page) Search box for the main site, for the store and for Google searching also. Juggling Store Brand new Juggling store using the VirtueMart shopping cart. Products are far easier to find and I have added many new products just in time for the launch, so please try the What’s New Page. Popular, Latest News and Search Cloud Tags These modules appear on the right hand column making it far easier to find the most recent and popular pages throughout the site. Far easier to subscribe now as the signup form (2 fields) can be found in the right hand of each page. This is the new look newsletter – what do you think? Community Interaction More of an interactive community feel to the site as you can leave a comment on any page, and add the articles to a variety of sources such as digg, del.ici.o.us, stumble upon etc. New Content All pages have been updated and rewritten, and the tricks pages have even more content! It is also now easier for you to submit your own tricks straight onto the appropriate page! At the moment, if you have bookmarked any of the pages from the old website other than the main address, an error page will appear, so please enter through the main www.jugglingworld.biz website address. I hope to address this issue in the next few days but was keen to let you all see the new website as soon as possible! Please have a look at the website and let me know what you think of it (be kind!) I have kept in mind lots of your comments throughout the past 18 months while I have been building the website, so I hope that you will enjoy browsing through the site and be regular visitors! In the previous newsletter, I offered advice on some of the many different styles of Circus Skills Workshops that exist. In this issue, I will offer advice on other aspects of running a Circus Skills Workshop. Different Ages Whenever possible, running a session with similarly aged kids is a lot easier than a mixture. The sessions should be tailored according to the age of the people. For under 6yr olds it may not be wise to try and teach how to juggle. They can have plenty of fun spinning plates, and learning the devilstick! Balls can be used in many throwing and catching games. I run Circus Skills Workshops for up to 30 participants at a time. I insist that there are at least one or two extra helpers provided by the organisation (eg in a school, the teacher has to stay with the class). Duration If you run a 1hr Workshop, then there may not be enough time for the pupils to learn every prop. If the session lasts 2hrs, then a decent show could be put on near the end of the session and there is plenty of time for the pupils to learn some tricks, practice with their friends and then perform! Public Liability Insurance If you are running Circus Skills Workshops, then you should consider taking out some Public Liability Insurance. I get my £2million Public Liability Insurance from Ace Europe. Equity Insuranceis what many of my juggling friends use. CRB Check Most people who hire you to run a Circus Skills Workshop will expect you to be CRB or Enhanced CRB checked. If you are self employed, then you will need to approach an organisation (such as a Church or a School to put you through the process. In return for them doing this, you might offer to run a workshop for free, so everyone is a winner! If you have a lot of Juggling Balls, Scarfs, Rings and Clubs in your workshop pack, then they can be used for many other purposes as well as juggling. More details in Issue 5 of my newsletter. Other Prop Ideas As well as the usual workshop kit, please read Issue 6 for more unusual props which are worth considering adding to your kit! There are many, many more issues regarding how to run a Circus Skills workshop, but I hope that these articles have proved useful and given you plenty to think about! If you have any further questions just let me know and I will be happy to answer them for a future edition of the newsletter. 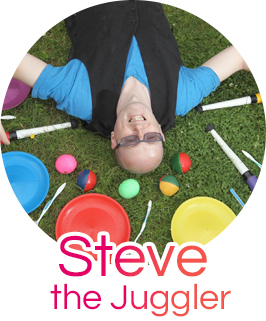 The Juggler for a Day Schools package is proving very popular, as is my 1hr Gospel Juggling show and 30min Schools Show at various events throughout Northamptonshire, Leicestershire, Bedfordshire, Cambridgeshire and Peterborough.